The GOODLIFE Clinic opened in October 2002 to address the primary care needs of those living with type 2 diabetes in the Omaha community. It is the third clinic that the SHARING Clinics have opened to help citizens of Omaha who cannot afford health care and do not have insurance. The GOODLIFE Clinic operates on the second Wednesday of each month at the Internal Medicine Clinic at the Durham Outpatient Center, 4400 Emile St level 5. Patients must demonstrate financial need to be seen at the GOODLIFE clinic. Patients are asked for a $10.00 co-pay at each visit; the fee is waived if the patient cannot afford it. 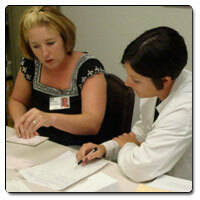 Those who attend the clinic receive comprehensive type 2 diabetes Care including laboratory evaluations and medications. This interdisciplinary clinic brings together medical, pharmacy, physical therapy, physician assistant, clinical laboratory sciences, family medical therapy, and medical nutrition students. For more information or to make an appointment for the GOODLIFE Clinic, call 402-559-4015.